Batman hits the heavy bag as he ponders the events of the evening. While at a social function Bruce couldn't shake the feeling that something wasn't right and the feeling wouldn't let up no matter how hard he hit the bag. Alfred announces the arrival of J'onn J'onzz, who accuses Bruce of being an affront to justice and quickly turns violent and attacks both Alfred and Batman. After the attack Batman meets with Superman in the Secret Sanctuary and tells him of J'onn's behavior. Their discussion of the attack and the feeling that Batman got at the party is interrupted by a distress call from Gotham. Superman assists in getting Batman back to his city and they find Titano rampaging through Gotham. 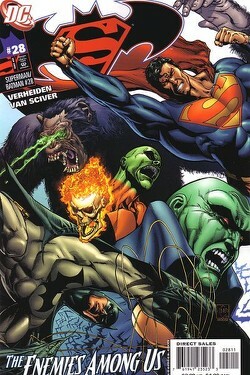 Superman is weakened by the giant's Kryptonite vision and is taken aback when the creature tells him to let Batman die. After knocking the monster back Superman watches in horror as Batman's aircraft crashes. Batman quickly reveals that he escaped the crash and the two further discuss J'onn's erratic behavior and powers. In the distance the two heroes spot the mass evacuation of the Gotham Aquarium. Superman rushes in leaving Batman to deal with crowd control. Suddenly the Parasite attacks and informs the Man of Steel that if he helps Batman then he dies too. Moments later Batman rushes in and comes to the conclusion that whatever they are facing it isn't J'onn. After the creature assumes the form of Dr. Phosphorus Batman demands to know what it wants. The supposed Phosphorus claims it wants to be acknowledged. It reaches out its phosphorus covered hands towards Batman but Superman pokes a hole in one of the tanks which lets hundred of gallons of water to spill into the room. The creature disappears and the two leave the Aquarium. Superman believes that it must have changed its form again, which means it could be anywhere. Story - 4: This is probably the first time in my nearly twenty years of collecting and seriously reading comics that the creative teams changed on a title but the tone remained the same. Verheiden has his own style and choice in what characters he uses but the over-the-top, popcorn movie, action packed, confusing as hell vibe that Jeph Loeb established in Superman/Batman is still there. To me this was the best way to go. Frankly when you put Batman and Superman in the same book it should have a big feeling to it. I mean there should be small, stand alone issues where the writer can do some soul searching with the characters but with two of the biggest icons in comics there has to be a reason for the team-up to occur. When I made my first read through on this issue I wasn't all that happy. It was pretty much on eleven from start to finish and for the first chapter of a story arc that can be daunting. But I read it again, as I usually do when I write these reviews and I realize that as much as it feels like I was dropped in the middle of a movie I know I also know that this feeling was probably intentional. Verheiden most likely wanted me to feel unsettled to reflect what Superman and Batman were going through. I liked that. Throw me off course. Make me feel like I have no idea what's going on. Provoke some kind of response. This is what writers should do. It is a heck of a lot better than feeling bored or that the story is going nowhere. I liked Verheiden's choice of villains for whatever it is that is going after Batman. A forgotten villain taking on the forms of forgotten villains. Well, forgotten villains and the Martian Manhunter, but that is beside the point. Titano, the Parasite and Dr. Phosphorus are not what you would call A-list villains. I mean I like them and think they are interesting, but they're not in the league of the Joker or Lex Luthor and that is rather the point. Again Verheiden seems to be working on two levels which allows for a complexity to a seemingly simple concept. In the end this was a great beginning to the story arc. Verheiden has held on to all of the aspects that I like about this series while keeping his own style. The frantic pace was a bit daunting but on closer inspection it was half the fun. There's a lot going on in this story. I like the fact that Verheiden has used a psychologically damaged villain to go after Batman because those are usually the best type of villain for the character to face. The stakes are high enough to warrant including Superman and Verheiden rode the line between them being adversarial and best chums well. From this story I get the sense that these are characters who have worked together so long that they can anticipate each other's moves and trust that the other will be there for them. Of course Batman kind of had the upper hand, but I guess that really doesn't matter. Art - 4: On the whole I liked the art and thought that Ethan's character designs were fantastic. Dr. Phosphorus looked like a threat. Van Sciver has shown in the past that he can take weak character concepts and make them appear dangerous and frankly a man who is a walking phosphorus factory should look destructive. Titano was another treat. A giant ape that shoots Kryptonite out of his eyes is another concept that sounds silly until the right artist makes it work. My only real quibble with the interior art is, and this is going to sound kind of nit-picky, Van Sciver's Superman. Overall I like the design, but the S is way too big and looks odd in most of the shots. I know. Picking nits. But when you feel a certain you feel a certain way. Other than that no real complaints. Cover Art - 3: I have to admit that as much as I enjoyed the interior work the cover did very little for me. There was just too much going on. Batman is there. Superman is there. Titano is there. J'onn is there. I think the problem is the heads of the Parasite and Dr. Phosphorus floating in the middle. The composition of the cover is fine. Van Sciver did a great job of using Superman and Batman to frame the piece but the floating heads are something of a bridge to far. I realize that the intention was to show all of the villains in one shot but the manner in which this was accomplished was not to my liking. This is nothing against Van Sciver personally. I just didn't like the cover.